I just spent several days in London, where I met with journalists and experts at think tanks to find out what’s happening with Brexit. 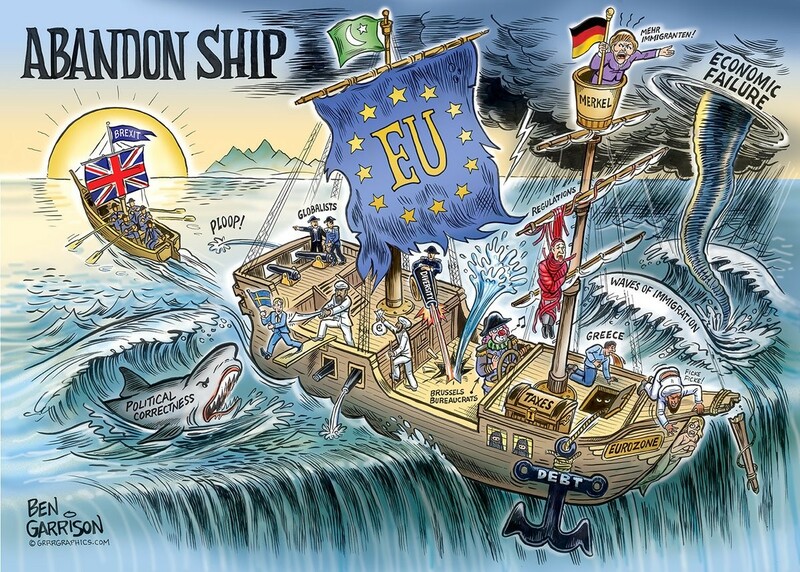 By way of background, I think voters in the UK made the right decision for the simple reason that the Brussels-based European Union is a slowly sinking ship based on centralization, harmonization, and bureaucratization. Membership already involves onerous regulations, and remaining a member of the EU would mean – sooner or later – sending ever-larger amounts of money to Brussels, where it then would be used to prop up Europe’s failing welfare states. Getting out may involve some short-term pain, but it will avert far greater pain in the future. At least that was the theory. The reality is that the Tory-led government in London has made a mess of the negotiations. The newly announced deal isn’t a real Brexit. Writing for the Telegraph, Dan Hannan, a British member of the European Parliament, sums up why the deal is a joke. The deal, as one Italian newspaper puts it, represents “a resounding victory for the EU over Her Majesty’s subjects”. Yet there was nothing inevitable about this climbdown. On the contrary, there is something extraordinary, awe-inspiring even, about the slow-witted cowardice that led British negotiators to this point. …there is something extraordinary, awe-inspiring even, about the slow-witted cowardice that led British negotiators to this point. …the disastrous acceptance of the EU’s sequencing, which meant that all British leverage, including the exaggerated financial contributions, would be tossed away before the EU even began to discuss trade. …Can you blame Eurocrats for gloating? They sensed right at the start that they were dealing with a defeated and dispirited British team, whose only objective was to come back with something – anything – that could be described as a technical fulfilment of the referendum mandate. …we have ended up with the sort of deal that a defeated nation signs under duress. Britain will be subject to all the costs and obligations of EU membership with no vote, no voice and no veto. Unbelievably, Britain has given the EU a veto over whether it can leave these arrangements: unlike EU membership itself, we have no right to walk away. Brussels will run our trade policy, our economy, even elements of our taxation for as long as it likes. As the usually Euro-fanatical Bloomberg asked incredulously last week, “Once Britain has acceded to this, what reason is there for the EU to agree to any other kind of deal?” …Leavers never did “own” this process. From the start, it has been controlled by those who wished it wasn’t happening, and who defined success as salvaging as much as they could of the old dispensation. That final sentence is key. Theresa May was not a Brexit supporter. She failed to play some very strong cards and she basically worked to come up with a fake Brexit. It remains to be seen, though, whether Parliament will approve this humiliating package. The House of Commons will vote in about two weeks and here’s how the UK-based Times describes the possible outcomes if the plan gets rejected. Scenario 1: a second Commons vote The prime minister fails to secure Commons support for her withdrawal agreement… Her response is to…then bring…it back for a second vote…, as happened in America after Congress initially rejected its government’s bank rescue plan in 2008. …Scenario 2: change of prime minister May fails to get the deal through and either resigns, or faces a confidence vote among Tory MPs which, if she lost, would also see her step down. …The question for Tory MPs would then be whether to back the deal mainly negotiated under May… Scenario 3: a second referendum A defeat for May could result in a second referendum but only if she or her successor supported it. Tory policy is to oppose a second referendum. …Scenario 4: no-deal Brexit Tory Brexiteers in the cabinet and in the party would respond to a defeat for the May proposals by pushing for a no-deal Brexit, or a “managed” no-deal. …Scenario 5: the Norway option Though there is no parliamentary majority at present for the May deal, or for no deal, there could be for a closer relationship with the EU. This could take the form of…the EEA (European Economic Area), the so-called Norway option. For what it’s worth, I fear “Scenario 1.” Members of the Conservative Party are like American Republicans. They occasionally spout the right rhetoric, but most of them are go-along-to-get-along hacks who happily will trade their votes for a back-room favor. So I will be disappointed but not surprised if this deal is enacted. It’s even possible it will be approved on the first vote. We cannot however be subordinate to a supranational institution… Nor should we make do with a semi-detached position inside the EU that also gives us semi-detached influence while still constraining the UK in the wider world. …we have to leave and reform the relationship in a characteristically British, outward-looking and open way. …The UK therefore requires something of a “soft” exit that maintains open trade but removes Britain from political union and from all that Britain has consistently struggled with – the Common Agricultural Policy, the Common Fisheries Policy, the hollowing out and the outsourcing of democracy, the constraints on global trade deals. …the most optimal way to exit would be to take up a position outside the EU but inside the European Economic Area (‘EEA’), which very likely means re-joining the European Free Trade Association (‘EFTA’). As Britain is already a contracting party to the EEA Agreement there would be no serious legal obstacle and it would mean no regulatory divergence or tariffs but it would mean retaining freedom of movement for EU/EEA nationals. …Such a deal would require agreement from the EU and EFTA but both would have strong reasons for allowing it…with the UK on board, EFTA would instantly become the fourth largest trade grouping in the world. …In short, EEA countries have a market-based relationship with the EU by having full single market access. They are free of the EU’s political union ambitions, and can class themselves as self-governing nation states. …The EEA position also opens up the ability to make trade agreements with third countries (something the UK cannot do now), would provide the UK with the freedom to set its own levels of VAT, and would allow the UK to step away from its joint liability of EU debts. That would be very attractive to Britain seeking a liberal soft exit. 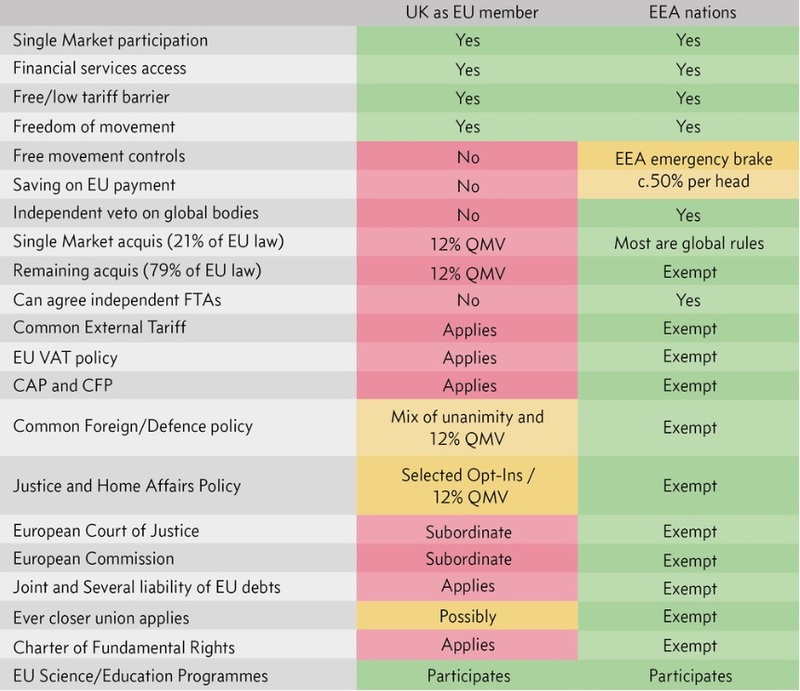 Here’s a table showing the difference between EU membership and EEA membership. Sounds like the outline of a acceptable deal, right? Not so fast. The crowd in Brussels doesn’t want a good deal, even though it would be positive for the economic well-being of EU member nations. They have an ideological desire to turn the European Union into a technocratic superstate and they deeply resent the British for choosing self-government and democracy. As such, the goal is to either maneuver the British government into a humiliating surrender (Theresa May was happy to oblige) or to force a hard Brexit, which would probably cause some short-term economic disruption. But there was also resistance on the British end to this option since it ostensibly (but perhaps not necessarily) requires free movement of people. In other words, it might mean unchecked migration from EU/EEA nations, which arouses some nativist concerns. Since I mentioned that a hard Brexit could lead to potential short-term economic disruption, this is a good opportunity to cite a very key section of Mark Littlewood’s recent column in the UK-based Times. The Treasury has suggested that GDP could fall by as much as 7.7 per cent if Britain exited the EU without a deal. However, is there any reason to treat this projection any more seriously than the Treasury’s view that the Leave vote itself would lead to a recession and a reduction in GDP by between 3 per cent and 6 per cent? Almost all official predictions relating to the economic impact of the Brexit vote have been shown to be enormously over-pessimistic. Why should one assume that present forecasts are not beset by the same flaws? Amen. The anti-Brexit crowd (the “remainers”) tried to win by arguing that a vote for Brexit would cause an economic collapse. That “Project Fear” was exposed as a joke (and was the target of some clever humor). And the new version of Project Fear is similarly dishonest. In a column for CapX, Julian Jessop of the Institute of Economic Affairs has additional details. The public is being bombarded with warnings of potentially devastating impacts on the economy, their security and their welfare if the UK becomes a “third country” at 11pm on 29th March 2019, without the Withdrawal Agreement and framework for a future relationship anticipated in Article 50. …the daftest headline…is that a “no-deal” Brexit means that the UK would run out of food by August 2019 (the 7th, to be precise). This relies on the bizarre assumption that the UK would no longer be able to import food, not just from the EU but from anywhere in the world, and that we would continue to export food even as our own people starve. …it is often assumed that the EU would ignore its other legal obligations, including WTO rules. …the EU would not be able to treat the UK any less favourably than other WTO members.. Relying on the courts to fix things is also ra.rely a good idea. But it is absolutely right that the EU can’t go out of its way to make life difficult for the UK either. Run out of food? Good grief, I thought the global-warming Cassandras were the world’s worst when it comes to exaggeration, but they’re amateurs compared to the anti-Brexit crowd. Anyhow, this column is already too long, but here are links to four other CapX columns for interested parties. I especially like the last column. One of the behind-the-scenes aspects of the Brexit debate is that the eurocrats in Brussels are scared that the UK will become more market-oriented once it has escaped the EU’s regulatory clutches. And just as the EU has gone after Ireland and Switzerland for supposedly insufficient taxation, it also now is trying to hamstring the United Kingdom. All the more reason to escape and become the Singapore of Europe. P.S. Donald Trump could help the United Kingdom by negotiating a quick and clean free-trade agreement. Sadly, that violates his protectionist instincts. Dear Dan, you are right on EFTA & EAA but wrong on all the rest. I discuss with you the merit of European Unification since 2002 when we met first time but you learn little sadly. How to blame all EU and EU Unification for some welfare state issue of some of the Western Member States? And not to mention all the achievement with the Internal Market, Competition & Anti Subsidies, Market Liberalisation from Energy to Railways etc and the recent key global trade agreement from EPA with Japan to many more as well to come. Well yes we could do TTIP but that we both failed for 15 years. Yes the EU needs to be reformed but the USA as well. And yes a perfect world would be fully market economy but well we do not have 100% of political support from voters fro that and so some public policy debates we did not win nor will we. Real live is real compromises with real voters and including all society in forging real policy. If you do it perfect in USA well we will follow. And no economist should be happy about the UK leaving a big market and stumbling into a crisis. The only effect of Brexit is less Western Unity and a long new Government of Labour under left wing Corbyn. Well done Tory and fully silly of the USA Conservatives or Libertarian backers of Brexit for me all a Putin funded plot expensive for Western taxpayers and detrimental for all Western consumers. Well long live USA and the West but please learn more about EU and European history before rejoicing such self inflicted targeted shooting in the own knee. In deep admiration of your tax and economics but on UK EU you are dead wrong, you listen to fools and repeat their claims. The UK will achieve no single trade agreement in the 2020ies with anybody but some Caribbean Ex Colonies not because EU blocks them but it is not so easy and they have not done any in 45 years and it will take time to learn and see who difficult it is. And then we see how different the terms will be the UK consumers and public will accept. Full of incompetence and wishful thinking and simple lies that is 90% of the Brexit and the rest is simple laziness – chickening out of the EU public policy debate and sad xenophobia. But anyhow with 99 % Brexit will anyhow fail as it will not pass Westminster than will be snap election then Labour will ask for extension and a new referendum and then it will be for a remain and for 2 decades of left wing Government in UK in EU and thanks a lot we have to deal than with a very difficult left Labor UK in EU making all kind of complication and support all kind of Anti Market pro Distribution Anti Trade coalition inside the EU. Well thanks you Tory Brexit Extremist and their non informed USA backer.